Volkswagen has confirmed plans to build an estate version of the Golf R. The 155mph load lugger will be powered by a 2.0-litre turbocharged petrol engine and be capable of rocketing from 0-62mph in 5.1 seconds. 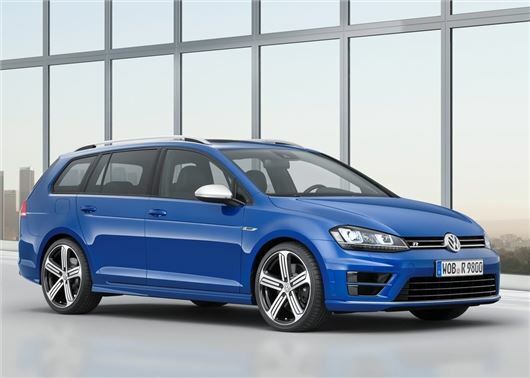 Prices are expected to start at £33,000 when the Golf R Estate reaches UK showrooms in July 2015. The Golf R Estate will use the same four-cylinder engine as the Golf R hatchback and also feature the same four-wheel drive system, which will switch to two-wheel drive to conserve fuel under light loads. Maximum torque will be 380Nm, from as little as 1800rpm, which should provide plenty of low ratio power to the six-speed automatic DSG gearbox. To cope with the extra punch, Volkswagen has added sports suspension to improve traction and cornering, while the ride height has also been lowered by 20mm. Volkswagen will also offer DCC adaptive chassis control with a driving profile selector as a paid for option. According to the official figures, the Golf R Estate will be capable of reaching an electronically limited top speed of 155mph, while emitting 163g/km of CO2. Volkswagen also claims its turbocharged estate will return 40.4mpg. The interior will get similar styling to the R hatchback, with leather upholstery, sports seats and sports steering wheel. There’ll also be a generous scattering of R logos and blue ambient lighting, along with an impressive 605-litres of boot space with the rear seats up. The exterior of the estate will get the R treatment too, with xenon headlights and LED signatures, quad tailpipes, R design bumpers and 18-inch alloy wheels. Lightweight 19-inch ‘Pretoria’ motor sport wheels will also be available as a paid for option. The Golf R Estate makes its global debut on 18 November at the LA Auto Show in the USA, but should get its European launch at the Geneva Motor Show in 2015. There are strong rumours that it will be joined by a production ready Golf R 400, which will raise the bar with 100PS more power and a 0-62mph time of just 3.9 seconds.